On this date in 1879, a half-blooded Native American named Pocket died in Hallettsville on an oak tree. The son of a French Canadian father and a Blackfoot Sioux mother, Pocket had been befriended by a cattleman named Lou Allen. They met by chance in the early 1870s; Pocket was a half-caste child, maybe not even into adolescence, with broken English, doing odd jobs to scrape by. That was in 1874. 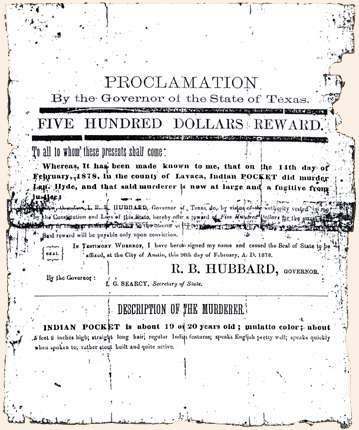 For the next several years Pocket’s activities are mostly unknown, save for the few times he popped back into Mr. Allen’s life — once to bum a suit of clothes; another time when they met by accident in Wichita, Pocket destitute after gambling everything away; and finally when Pocket reappeared in Lavaca County only to be refused aid by his benefactor in a possible gesture of tough love. Pocket found work on a nearby farm instead. On Valentine’s Day 1878, Pocket was seen in the county seat of Hallettsville getting roaring drunk on whiskey. He left town for the countryside carrying another bottle and proceeded to stop at several farms to accost their residents. At the Smith house, he barged in, stole a pistol, and forced his way into the family dinner. He stumbled into the home of a former slave named Frank Edwards, ripped up bed clothes, and started swinging an axe around until Edwards punched out the unwanted visitor. Fuming, Pocket proceeded to yet another farm, the Petersons, where he contrived to get the family hunting rifle by representing the presence of a drove of turkeys nearby. A young Brit named Leonard Hyde worked for the Petersons, and he went along with Pocket “to see the fun.” As ominously as this reads, Hyde had no reason to suspect trouble; the Galveston Weekly News would note that Hyde and Pocket “were both under twenty-one years of age, friendly with one another up to the last moment, and both strangers in the land which has given to each of them a grave.” Two kids out on a turkey-shooting lark. Hyde trotted along on foot after Pockett, and soon another of Hyde’s friends joined the supposed hunting foray. Suddenly, their intoxicated leader stopped and cursed Hyde for following him — then shot him dead through the forehead with his pistol. The killer’s mind was obviously disordered and impulsive, but it’s possible that Hyde died in place of Frank Edwards, or if not Edwards then whomever Pocket might have crossed paths with next that night. Now with blood on his hands, Pocket did not pause to revenge any other slights but galloped off into the wilderness. He was eventually captured in Bosque County. Perhaps three thousand souls turned out to see a repentant Pocket die in Hallettsville on September 12, 1879 — “every road entering this town became alive with people of all ages, sexes and colors, without regard to previous condition, coming to witness the first legal execution in this county.” Pocket had spent his last weeks in religious devotion and struck those who saw him as a profoundly changed man. The great hanging-tree can still be seen today, shading a picnic-table in City Park, next to the Hallettsville Golf Association clubhouse.